The �Disruption� of 1843, when around one third of the Church of Scotland�s clergy walked out of the General Assembly and formed the Free Church of Scotland, prompted a proliferation in ecclesiastical building throughout Scotland, and Sanday was no exception. On the 20th March 1849, George Traill granted to the "Trustees for the Congregation of the body of Christians called The Free Church of Scotland worshipping in the Island of Sanday" three acres and two roods of land upon which to erect a manse, a school and a schoolmaster's house - the church itself having already been built on the plot. Of those buildings, only the manse, now called the West Manse (probably since the formation of the United Free Church in 1900), has survived into the 21st century in its original form. 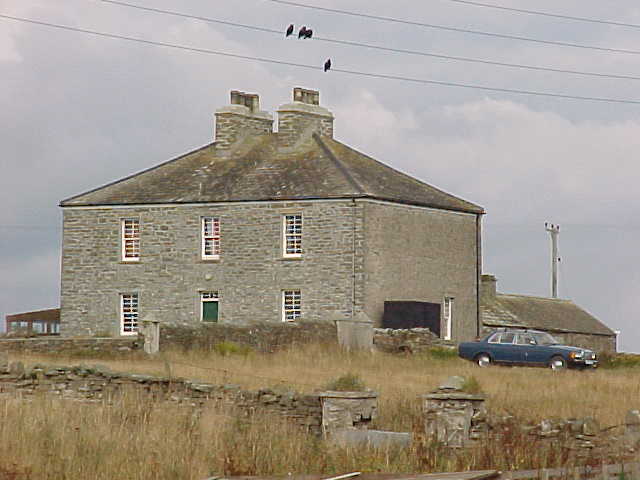 Nearly two years after George Traill�s grant, on the night of the 31st March 1851, when the national census was taken, the Free Church Manse was being occupied by Matthew Armour (Sanday's famous radical Free Kirk minister), his wife and 7 month old daughter, his brother, a servant girl and the minister of the Free Church at South Ronaldsay, who was visiting. The Revd. Armour resided at the house until 1903, the year he died. At the commencement of the 3rd millennium, after standing empty for some years, the West Manse has recently become the home of Drs. Stephen and Ute Clackson, their daughter Aelfleda and two sons Wulfric and Dunstan, who moved from Germany to Sanday in December 2000.